Ketnet, VRT's children's TV network is wildly popular to kids aged 1 to 12. Together with Ketnet we redefined their services online by creating a complete ecosystem with a series of apps for smartphones and tablets. 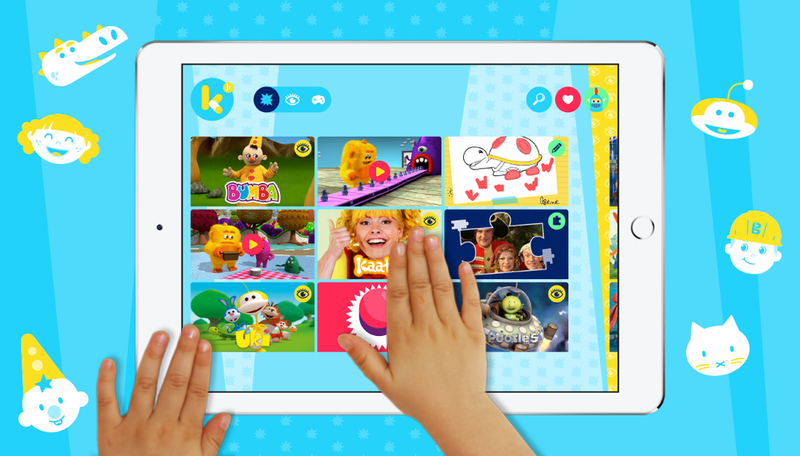 Ketnet jr. is targeted at kids aged 1-6: the text-free app offers all Ketnet video content and can be easily explored and viewed at the children's own pace, without parental interventions. Personal recommendations, based on the children's behavioural level and viewing habits, are presented after finishing a video, game or interaction. In order not to transform our kids into binge zombies, we have added playful interactions and games based on the characters of the episodes. Video content is linked and synced to interactions: e.g. when a kid finishes the latest Musti episode he can colour and share a beautiful Musti drawing. Content and interactions are seamlessly linked , making the app more fun. more educational and more diverse than a Netflix binge session. The set of games and interactions will grow as Ketnet can plug new HTML5 games into the native app architecture. The Ketnet app is aimed at children aged 6 or older. The Karrewiet app is a smartphone news app aimed at children aged 9 or older.